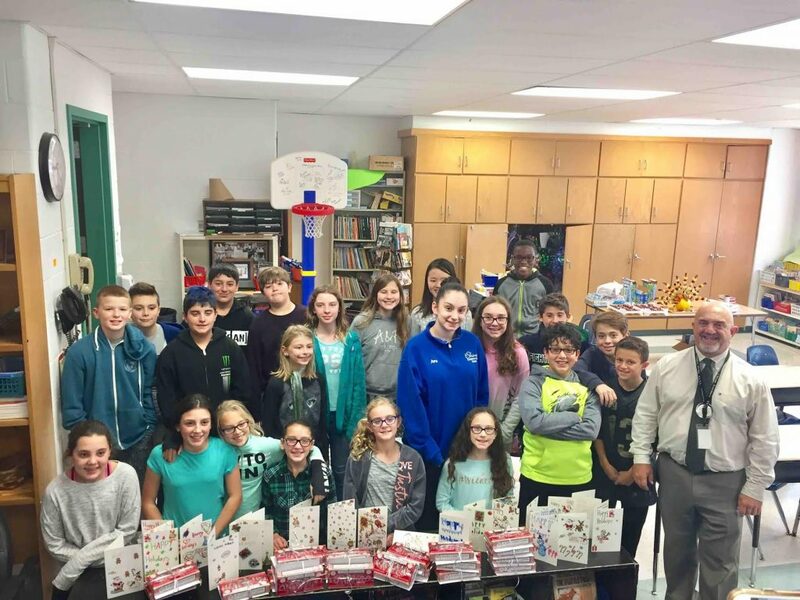 Three Village Central School District’s Minnesauke Elementary School sixth-grade students in Lou Petrucci’s class helped to spread holiday cheer within their local community an abroad during two recent community service projects. The students made holiday cards, trinkets for gifts and donated gifts to the children at Angela’s House in Stony Brook. This establishment assists families caring for medically frail children living at home with their parents or in special homes that offer 24-hour nursing support. Additionally, the class participated in Adopt-a-Platoon to provide a bit of the holidays and the comforts of home to those service men and woman deployed oversees. For the initiative, the students made cards for the soldiers with boxes of candy canes. Photo caption: Minnesauke Elementary School sixth-grade students in Lou Petrucci’s class helped to spread holiday cheer within their local community an abroad during two recent community service projects.